As always, skip to the project if you are in a hurry. This project really transformed my square white table, that used to be in the kitchen, but you already knew that didn’t you? I do love to play musical chairs with my furniture. And this time, it really wasn’t my fault, REALLY. 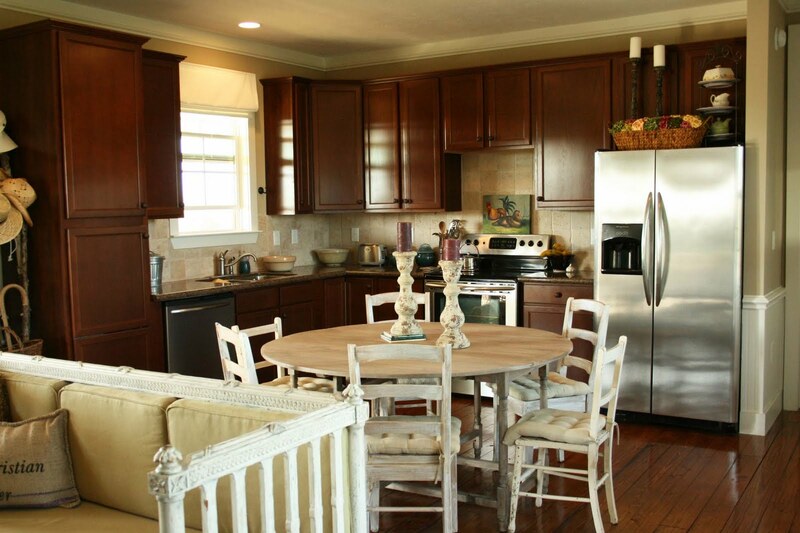 Below is a picture of the table in the kitchen. This table is great for everyday use since it is very sturdy. (Some of my beautiful antiques are nice to look at, but let’s just say, if Mr. CH used them to get up off of the floor they would snap like a twig.) This table didn’t always look like this. It came to me second-hand from my dear friend, Peggy. The house at Cedar Hill was being built, and she wanted us to have a good, solid table for our kitchen. She offered it to me, knowing that it wasn’t really my style. In fact it was actually her daughter’s old table that had been purchased from World Market. She wanted to be certain that we had some place to sit, so that when she came she wouldn’t end up sitting on the floor. I told Peggy that I would be very happy to have the table and chairs. I then sent Mr. CH to work the next day with my SUV, so that he could get the table and chairs on his way home. Since Peggy’s daughter lived far from my house but near Mr. CH’s office, I thought he could get it after work. As planned that day, he headed to Emily’s (Peggy’s daughter’s) house to get the table and chairs. Emily’s husband helped Mr. CH load the chairs and table into our SUV. Where was Emily, you ask? At work. You see how we avoid the heavy lifting? After the furniture was loaded, Mr. CH called me, asking, “Have you SEEN this table? Are you SURE you want it?” He knows me. He couldn’t believe that I wanted the set. I assured him that I had indeed seen them, and that they would work just fine. I am sure he was shaking his head the entire trip home, concerned that I would make him return it all the next day, but I wasn’t worried, I had a PLAN. I really should have taken a BEFORE picture, but Peggy did find this picture for me to show you. 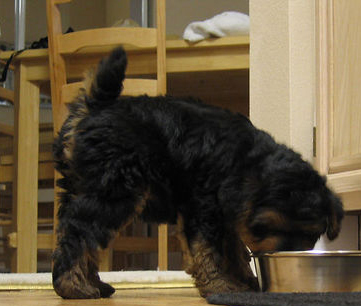 The table and chairs are there hiding behind Emily’s adorable, little puppy. 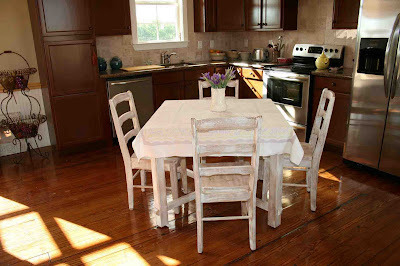 As you can see, this table and chairs originally had a very glossy finish. 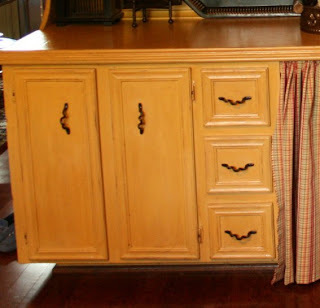 I first used a liquid sander on the furniture, applying it with an old cloth. Then while the furniture was still wet, I applied a primer using a brush. Yes, you heard correctly; I apply the primer while the liquid sander is still wet. I don’t know why it works, but it does. The primer sticks even better before the liquid sander dries. When I painted the wood paneling at my city house and the buffet in my breakfast room, I also used a liquid sander, painting while it was still wet. I did not sand the paneling; I just used liquid sander. The painters I spoke to thought I was nuts, but it worked, and the paint still looks great years later. Tip; If you are painting a big surface, tint your primer the same color as your base paint to minimize how many coats of paint will be needed. Buffet, painted with yellow paint, then covered in a dark brown glaze, and then sealed with a semi-gloss sealer. When the primer dried, I painted the table and chairs Ralph Lauren paint (Cottonwood TH29). When that dried, I touched up spots that were in need of more paint. Next, I applied Ralph Lauren Faux Technique Glaze (tinted with Smoke AG03 paint). The glaze is a lot thinner than the paint, but that is so that the paint color underneath will show through. See the glaze effect below. 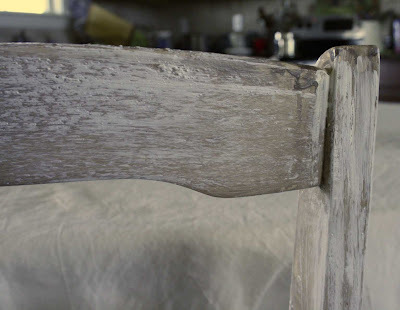 You want the darker paint to go on in an uneven fashion to add an aged effect. Use long brush strokes and don’t apply this glaze too thickly. You don’t want it to clump or drip. For more information on this paint and technique, you can go to the Ralph Lauren Website, Ralph Lauren Aging Technique. If you like the look, you are now finished, but I thought the look was not exactly what I wanted, so I added another layer of paint. I wanted something a little whiter to go with the Swedish Bench in the room, so I applied a layer of white paint, using a dry brush technique. This means that you barely dip the dry brush in the paint, and remove any excess. Then gently brush the paint on the furniture very lightly. You don’t want to apply so much that you can’t see the layers of paint underneath. See a close-up of the finish below. Close-up of paint finish after the white paint was applied. Note that the brush strokes are long strokes always in the same direction. For more information about dry brushing, click on this link Dry brush technique. Below is another close-up of the finish. The white paint actually went on in a rough finish, meaning it was thick and clumpy in places. I liked the clumpy finish as it made the furniture even more rustic and old looking. This is what I refer to as a happy mistake, meaning that my mistake has accidentally improved the finished product. After painting the table and chairs, I thought they looked fantastic. Some people even thought I bought them that way. So why did this table end up on the back porch? Well, as much as I loved the table, it just would not accommodate more than 4 people. We often have a guest there as Mr. CH’s mother is a frequent visitor and also Claire many times brings a friend. Most of the time we eat outdoors where there is plenty of room for guests. But when the weather is too hot (the entire month of August, as far as I am concerned) we are stuck inside. Knowing we didn’t have enough indoor seating, Peggy gave us yet another table for Cedar Hill. I appreciated having the extra seating, but it was awkward when we had just one guest. You can’t have four people at one table and one at the other. We would split things up so that two people would sit at the extra table while the other 3 sat at the square white table. I tried to make it sound exciting for those “stuck” at the extra table. I even referred to the extra table as “The SPECIAL table” so that whoever got stuck was blessed enough to eat there would feel honored, nay privileged to be allowed to dine there. I don’t think they bought it, and so I would end up there most of the time. I was hoping to get a table large enough so that we could seat 6 people in the kitchen when necessary. So when Wisteria had a sale on this table, I said, “SOLD!” I wanted a a white table to coordinate with the white Swedish bench in the room. This table is actually a little on the grey side, but it goes very well with white. The sides fold down, so it can be made smaller when no guests are here. I thought we would keep one side down when we had no guests but I like the look of having booth sides up and there is plenty of room for the table with both sides extended. The finish is a whitish gray, and I found that it didn’t need any paint, but was perfect the way it was. It’s 60 inches wide, so there is plenty of room for 6 people and I think we could seat up to 8, without too much squishing. You can see why I needed to get another table don’t you? I really had no other choice. We can’t stop having guests just because of a table. When the table was delivered, it was clear that there was no way the truck was going to make it across our bridge, so we had to meet them at a nearby business in their parking lot to load the table in our SUV. We removed the seats and left the kids and dog at Cedar Hill. I wondered if the box would fit or if Mr. CH and I would be carrying the table all the way down the county road back to the ranch. It fit! Can you believe it with 1/2 inch to spare? Thanks Wisteria!! We LOVE the table. So glad to have this paint technique in writing. 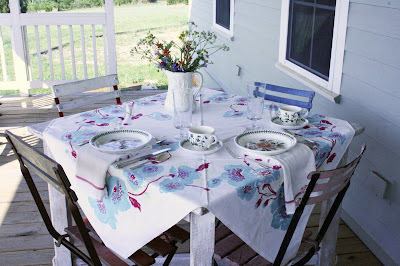 Love the table setting on the back porch with the Portmeirion Botanic Garden china, the vintage tablecloth, and the milk jug filled with wildflowers. Didn’t know you had Portmeirion china TOO!!! And the Wisteria table is perfect in the kitchen. I will have to try that paint technique one day. (Sure would be nice to have some company – hint, hint!) 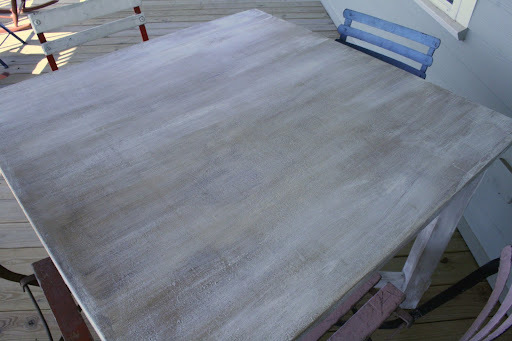 The table does look so much better – painted – and serves a better purpose on the porch. I love the Wisteria table. Can’t wait to dine at it (unless it is too lovely outside and we sit at the farmhouse table). So many pretty pics on your blog – I’m just loving it – and your writing. Who knew my dear friend had so many talents? Okay, well maybe I did – but it is nice to see it.